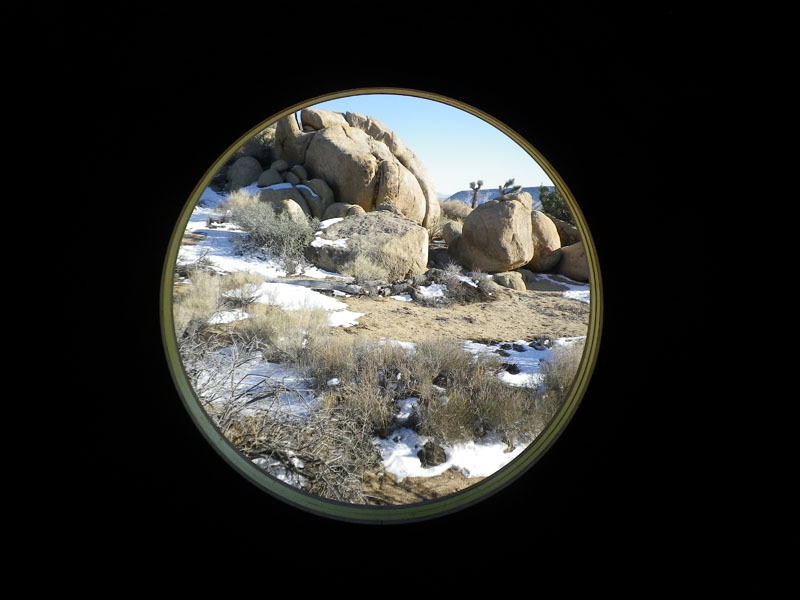 In Southern California for my show this winter, we took a little detour to the gorgeous Joshua Tree National Park, known for its fabulous boulders and breathtaking scenery, but also for the oddball collection of artists who have made the area around it home. 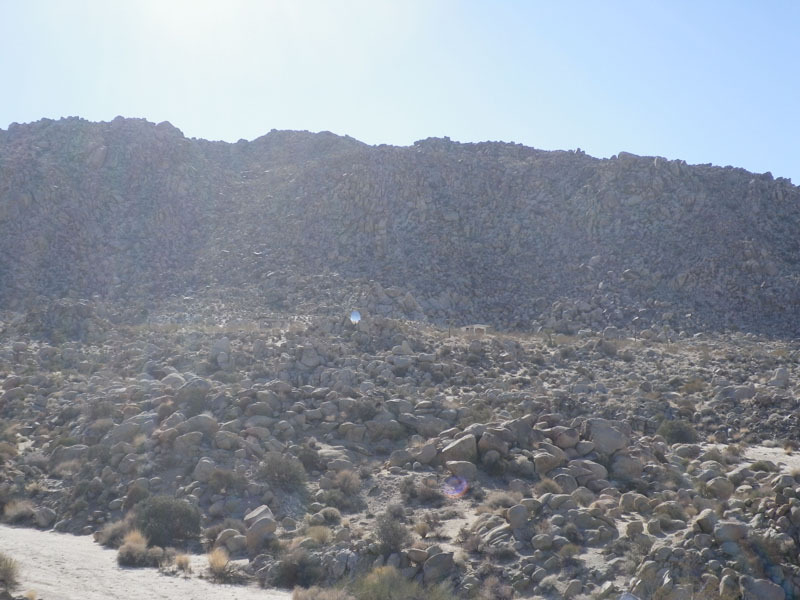 Looking up into the hills, you might spy a little compound – an old Airstream, say, a few broken-down trucks and toilets scattered about, a collection of dwellings made of corrugated metal or tires – and you think to yourself, who’s living up there? Artists or rednecks? It’s really hard to tell, and just as likely to be the one as the other. 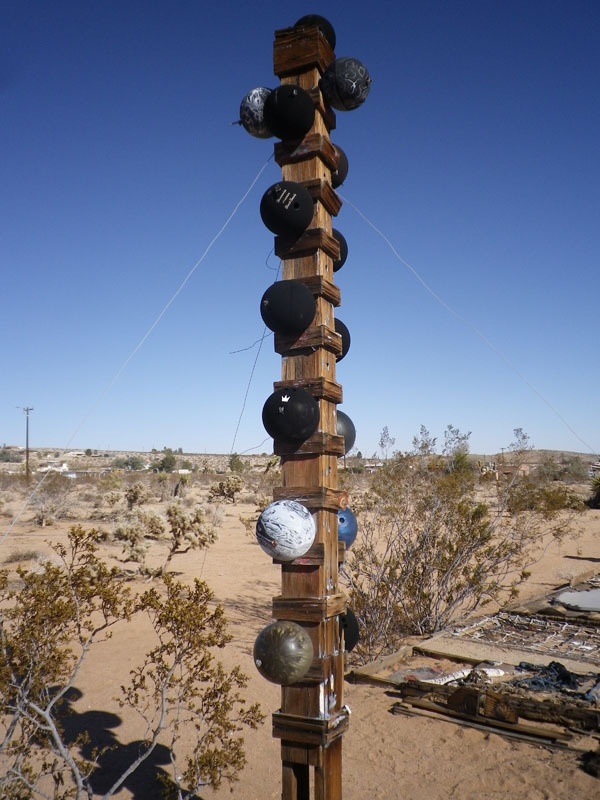 Welcome to Joshua Tree! Up in the rocks here you can see a little glowing obelisk from the highway. It’s a untitled piece by Sarah Vanderlip, made from welded truck bumpers. 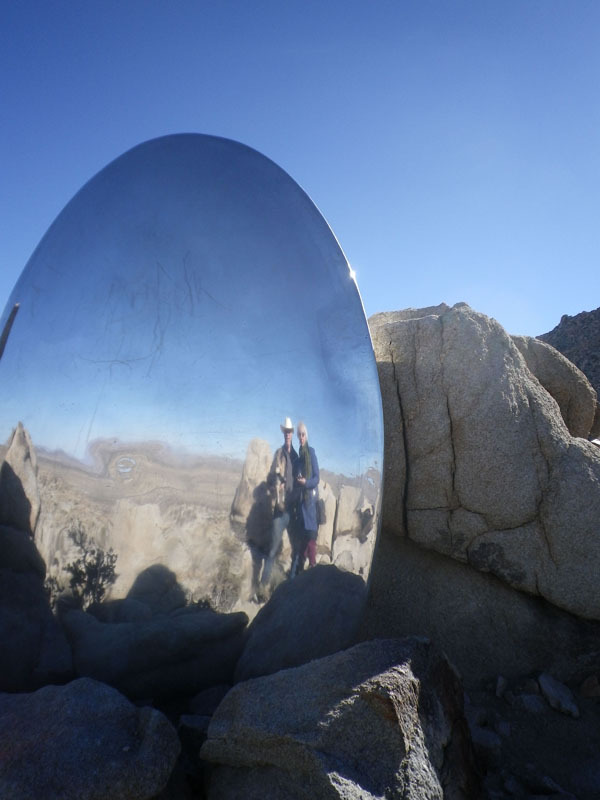 It’s glowing because the sky and the light of the desert are reflected in its smooth surface. The whole ten-acre parcel is called Behind the Bail Bonds (which was helpful in locating it) and features some rotating projects as well. 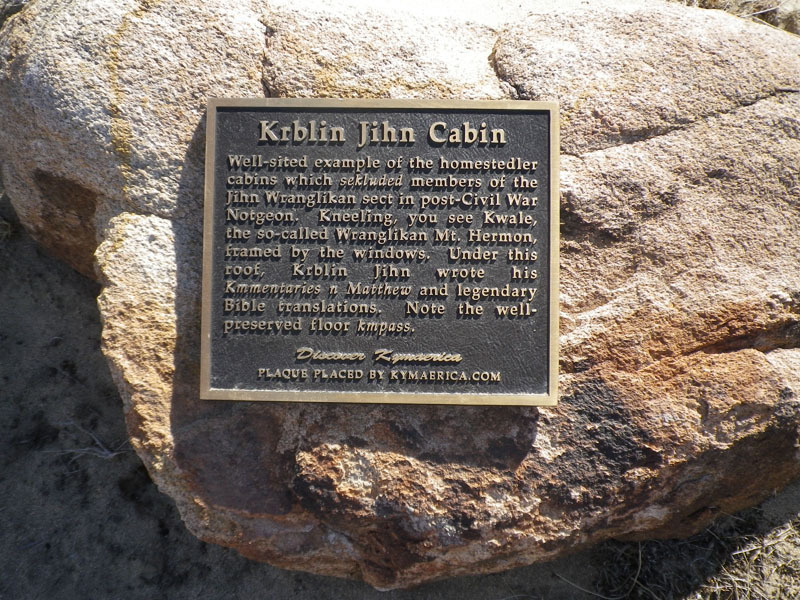 Onward to Krblin Jihn Cabin, the promised fake historical site, complete with official-looking plaque and backstory involving a made-up religion (isn’t that redundant?) and made-up religious civil war. 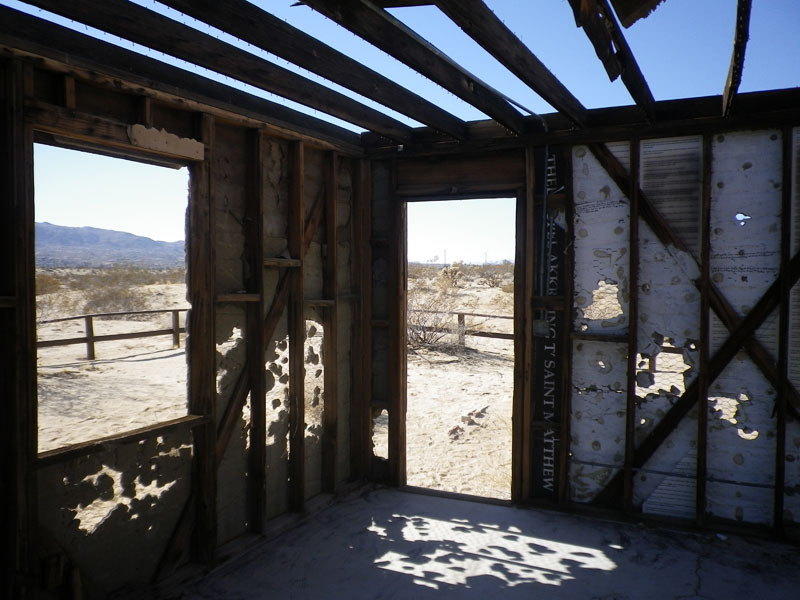 It’s an old miner’s cabin, of which the area boasts many, retrofitted for an imagined past. The actual history of the American West is so full of cults, revelations, weirdos, and skirmishes over promised lands that this fake version, with its taboos against certain vowels and nine-pointed compass, really doesn’t seem that far-fetched. 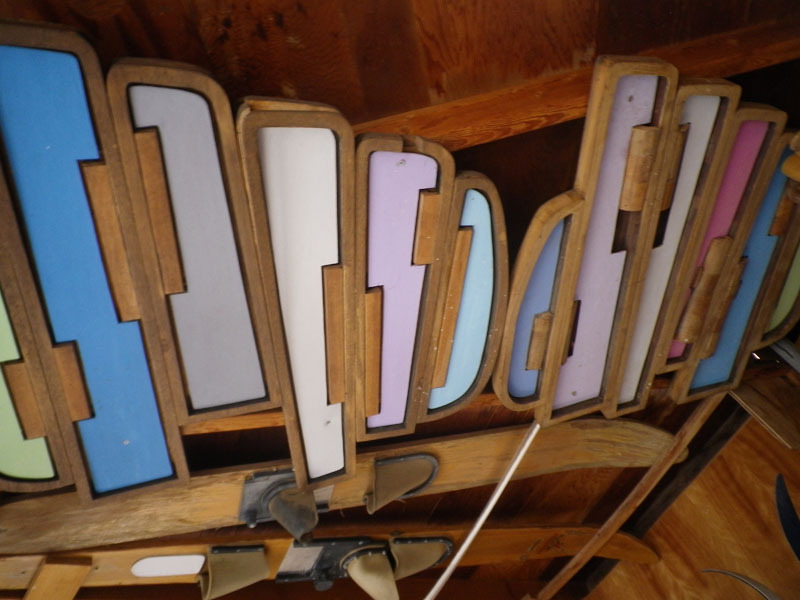 This cabin is the work of artist Eames Demetrios. For his whole constellation of fake history sites scattered around the globe, you can check out kymerica.com. 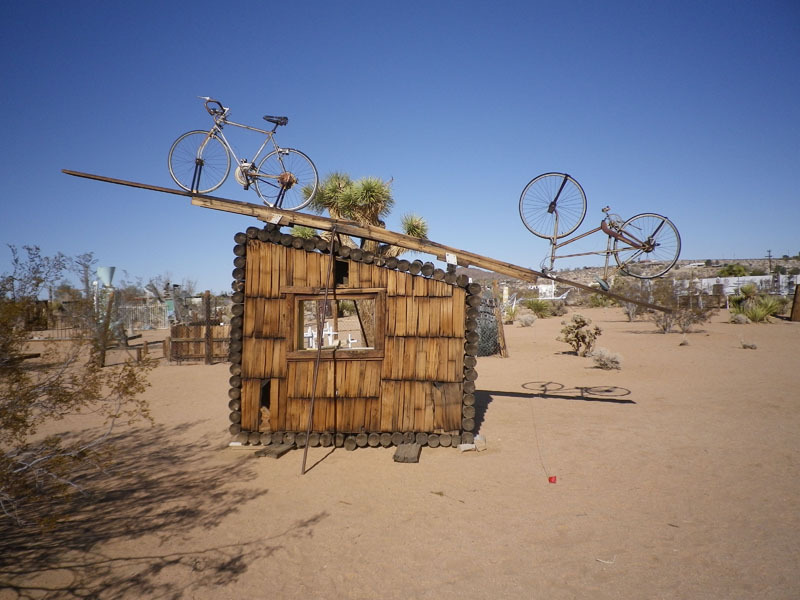 For some actual history, we proceeded to Noah Purifoy’s Outdoor Desert Art Museum, the artist’s home and studio that have been preserved pretty much as he left it at his death in 2004. 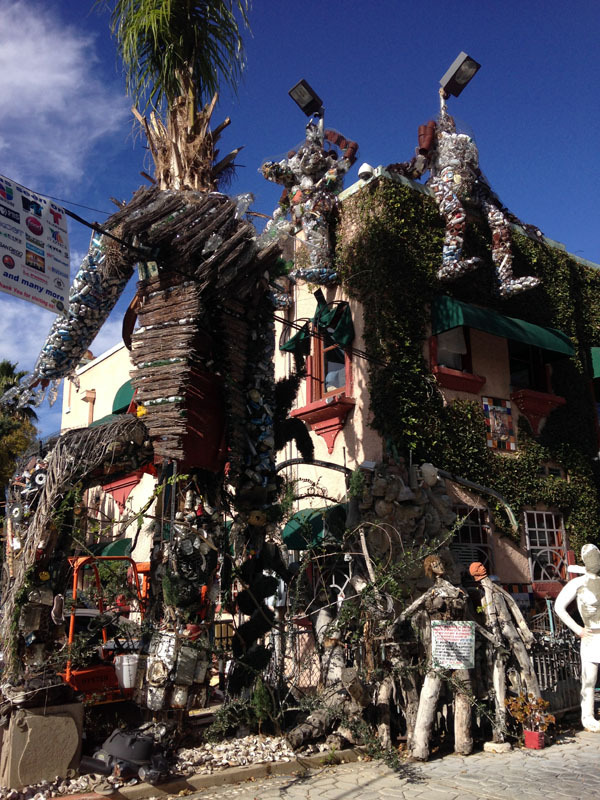 Mr. Purifoy was instrumental in recognizing and preserving the Watts Towers in Los Angeles, and himself later created sculpture from the burned remains of the Watts riots in the 1960’s. 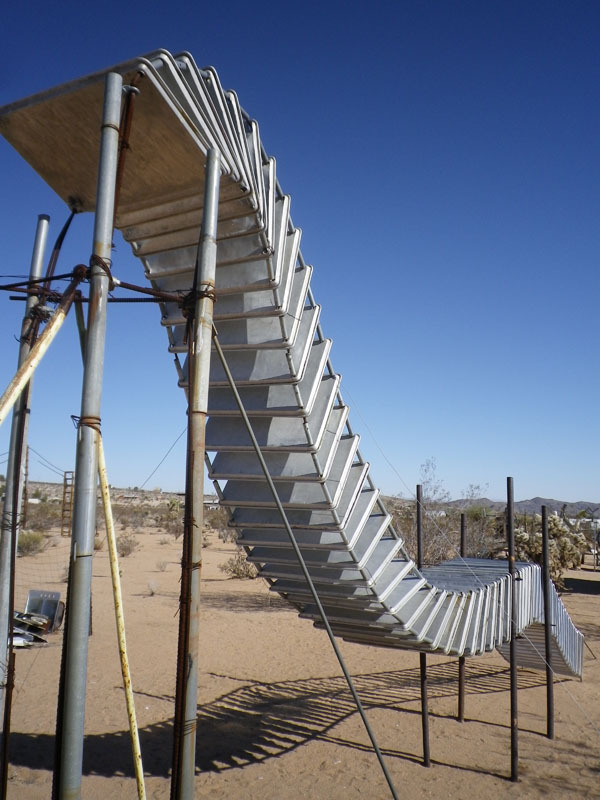 He decamped to the desert in the late 1980’s and spent the next fifteen years creating the large-scale found object constructions that fill the ten acre parcel. His neatly sorted bins of scavenged objects are preserved there, too, awaiting the next project. 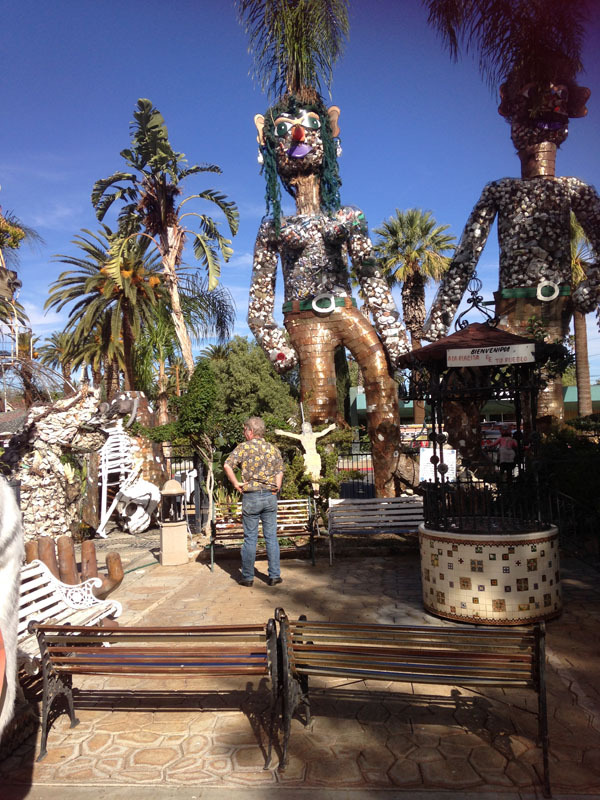 Some of the art you could walk right into. . .
. . . and find more cafeteria tray sculptures there. 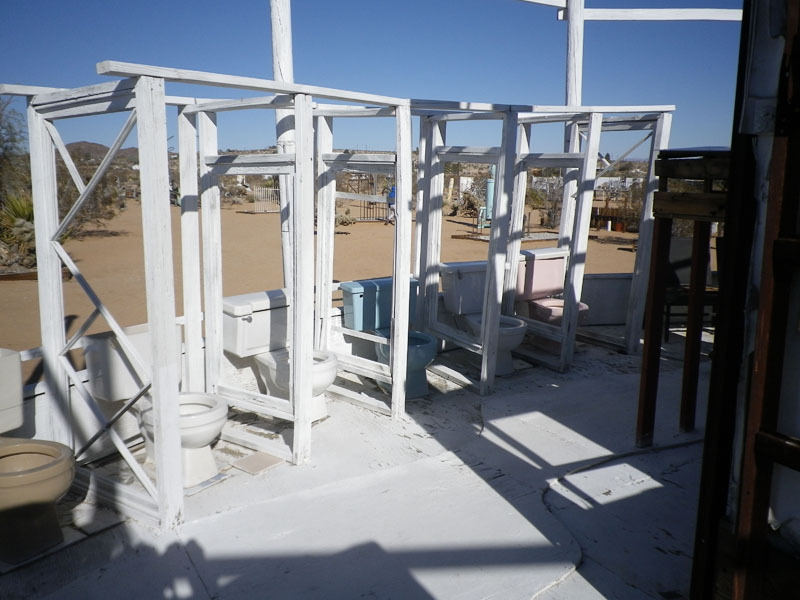 Toilets, presumably also military surplus, figure into many of the pieces. Simultaneously creepy and banal, there is something really disconcerting about encountering something so private in such an exposed space. 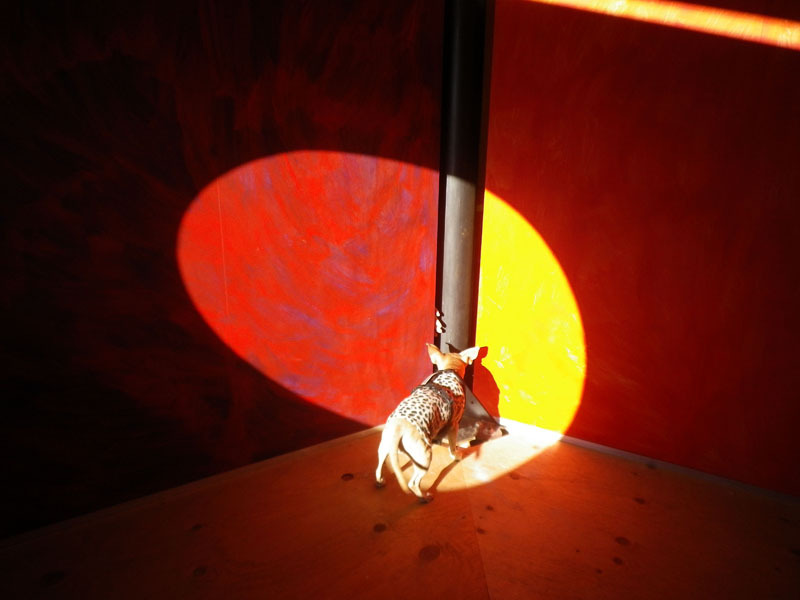 ..but the effect of the winter light projected through the circular cutouts onto the painted walls was striking it its own right. 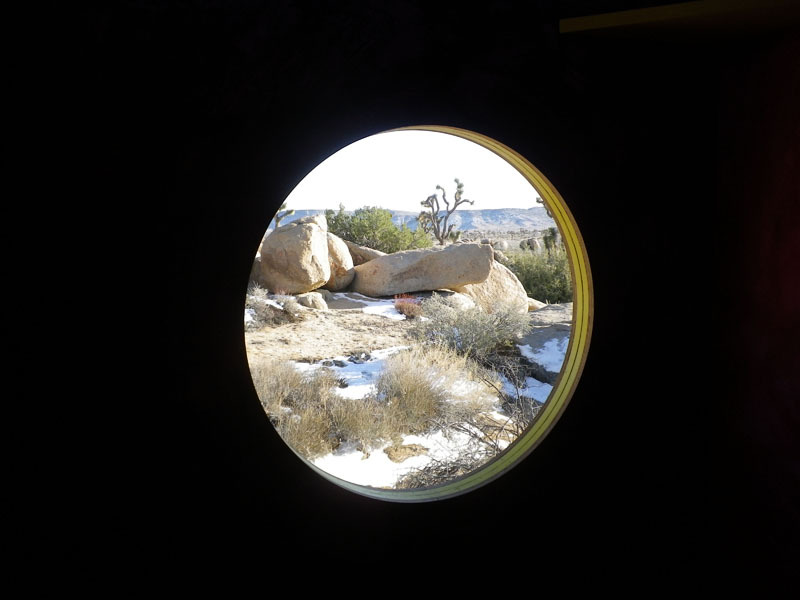 In the town of Joshua Tree itself, we visited Art Queen, the studio and gallery of the lovely and welcoming artist Shari Elf. 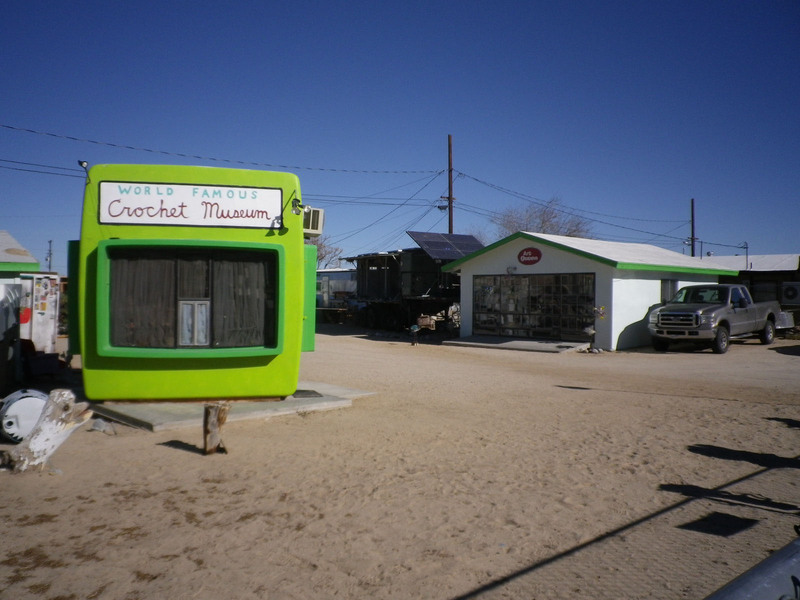 Shari curates the World-Famous Crochet Museum, a Fotomat-like pod painted lime green and stuffed full of some spectacularly ill-advised craft projects, all crocheted, as the name implies. I think we know who is dinner in this Thanksgiving scenario, and it ain’t the turkey. Unless the pink pony or Mother Goose gets to those tasty pilgrims first. 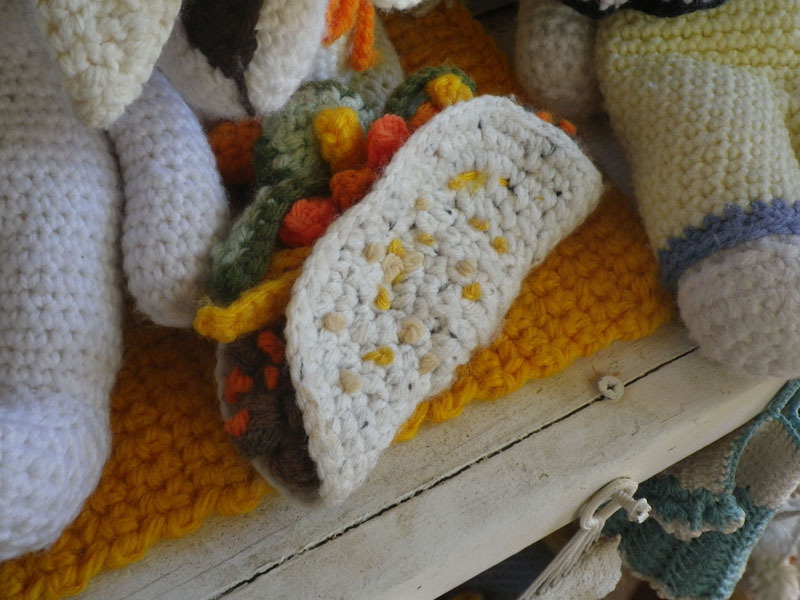 And I am wondering how I managed to get through this much of life without having previously encountered a crocheted taco. Genius. Speaking of tacos, perhaps the most memorable art emporium of all wasn’t in the Joshua Tree area at all but in the middle of Riverside, on the way back to Los Angeles. 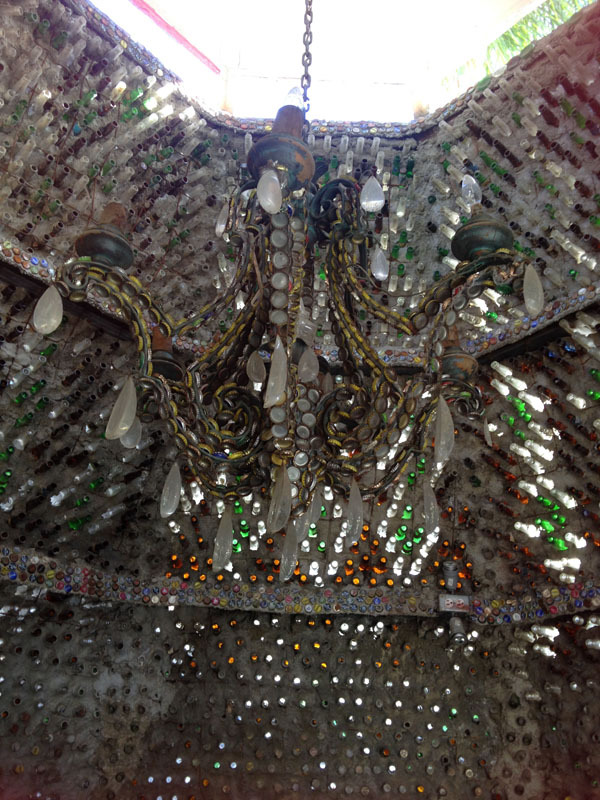 Tio’s Tacos is both a tasty lunch stop and a city-block-sized art project, the work of artist and restauranteur Martin Sanchez, who immigrated from Mexico in 1984 and proceeded to build this visionary dream house. 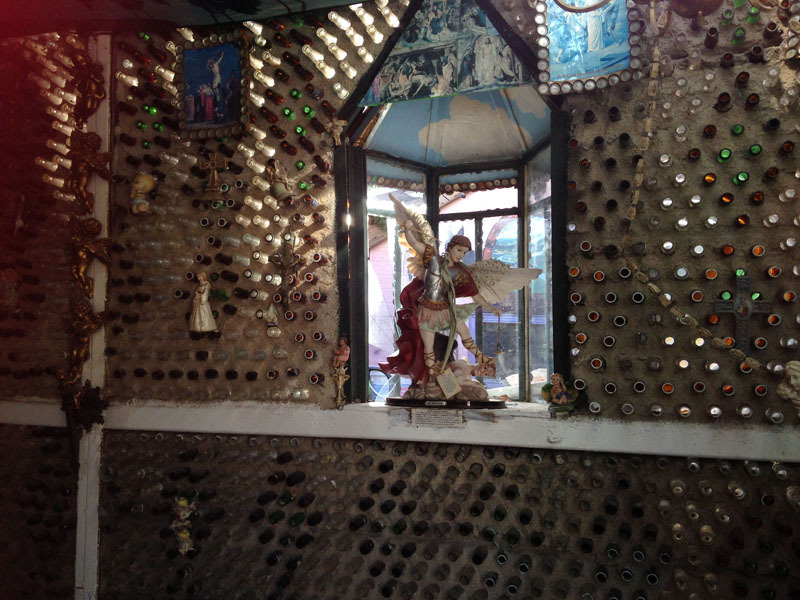 Take a stroll on found-pottery-mosaic colored paths and into small chapel-sized buildings made of stacked and cemented bottles. Entire palm trees have been made into benign giants who stand guard over all this abundance. 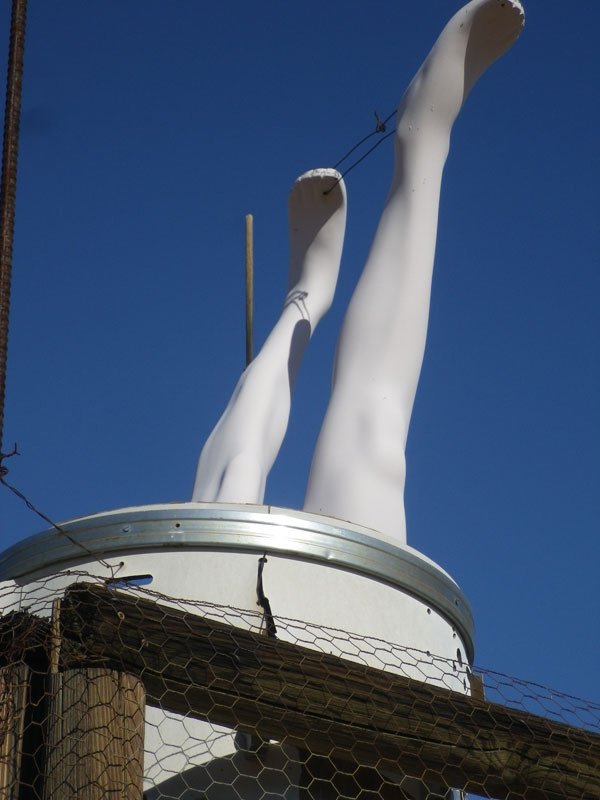 These lovely ladies are made of rusty #10 cans: whole ones encased in chicken wire form their torsos, and overlapping flattened ones wrapped into cylinders are their legs. Their hair is made from fishing nets. 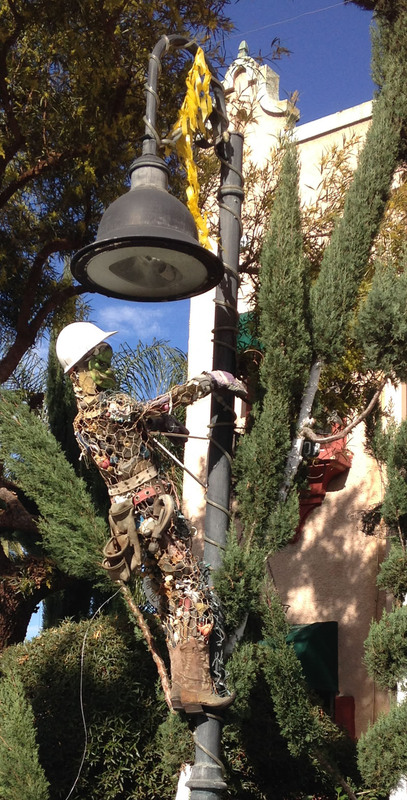 Even the lights are anthropomorphic (more can-people) and the palm-tree creature on the left is partly constructed of plastic bottles. I am partial to the cowboy-boot-shod lineman. 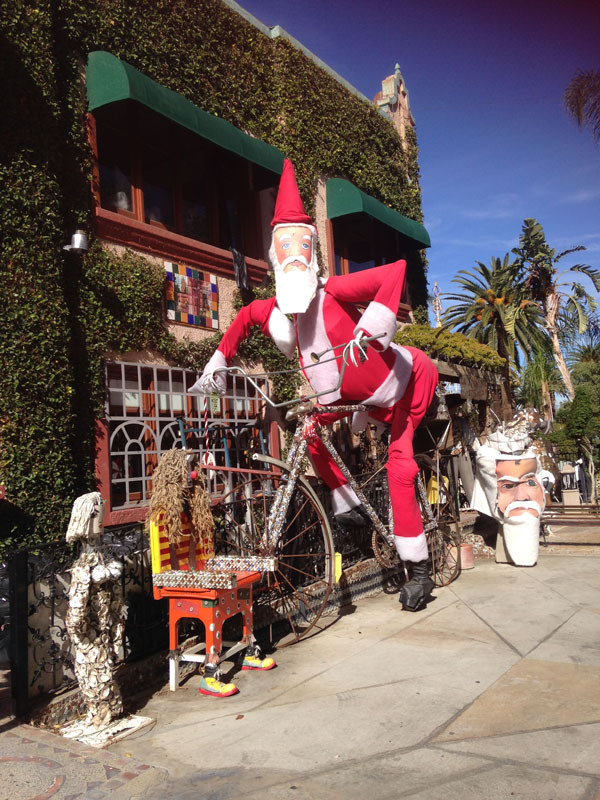 And of course, Santa-on-a-bike. 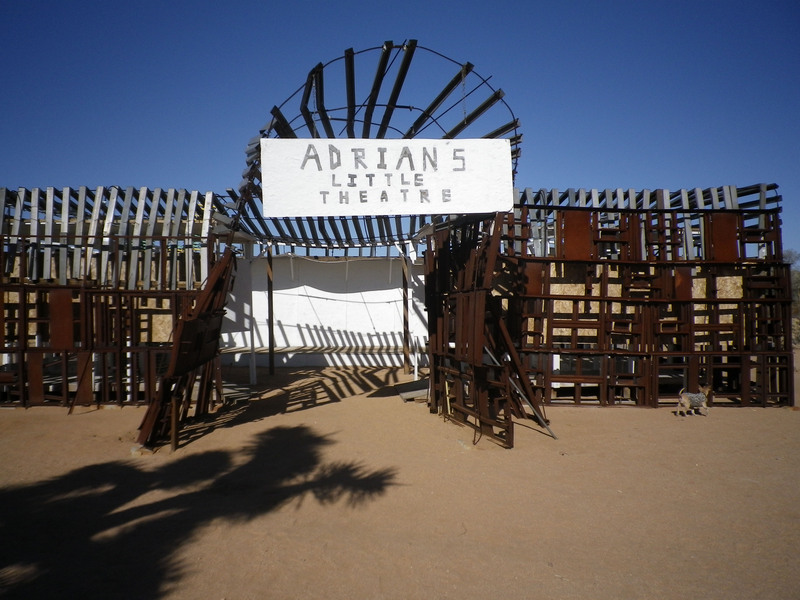 The whole desert art tour embodied for me something quintessentially American: Visionaries light out for the wide-open spaces, where they build unexpected paradises of weirdness out of quite ordinary detritus of our throwaway culture, redeeming it, and maybe us a bit, in the process.